One of our customers provided us with regular updates to his deck including his original plans. We wanted to show them to you as to how easy it is to create a truly custom deck. Finished Tigerwood DeckTigerwood Deck 4 Wow this Tigerwood is the Cat’s meow! 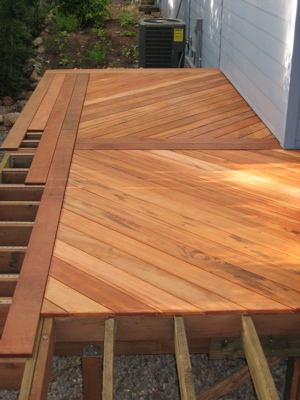 David created a very customer high end deck using borders with Tigerwood diagonals. The Finisher really bring this deck to life.